Just as marketing, communications, PR and word of mouth are tools for day school advocacy, it is important that Jewish schools have research and data to support the Judaic side of their programs, as they do in general studies. 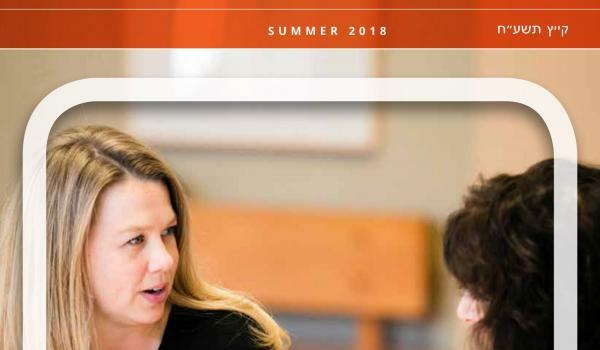 The Consortium for Applied Studies in Jewish Education (CASJE) has responded to the gap in Jewish educational research with a set of literature reviews, among other efforts. We will use these reviews as an example of how research may be mobilized to make the case for Jewish day schools. CASJE’s Hebrew Language Education Literature Reviews serve at least two vital functions. The first is the obvious clarity and direction they give for educators challenged in the day-to-day work of teaching Hebrew. The second, less obvious but equally important, is the way access to this research professionalizes the teaching of Hebrew by giving educators the expertise to make thoughtful, researched-based decisions and, thereby, present a compelling case for Hebrew language learning more generally. While we will focus here on some of the practical lessons we can take away from the literature reviews, we believe the second point carries weight in the ever-increasing demand placed upon day schools to justify their mission to a community that questions its value. The benefit of even these few studies suggests that more sustained and robust programs of research hold the potential to advance the field exponentially, and as a result, provide a compelling value proposition for the work Jewish day schools do. The first research review, written by Chad Walker, details the unique aspects of Hebrew writing, the challenges students face in learning how to read Hebrew as a foreign language, and the ways in which having a first language (particularly English) can aid or present difficulty not only to learning a second language in general, but Hebrew in particular. (To be clear, foreign language teaching is different from teaching a first language.) He makes a fascinating observation into the gap between facility in Hebrew reading and comprehension of Hebrew texts. Hebrew is composed of three-letter roots, or shorashim, which, depending on their various constructions, prefixes and suffixes, as well as vowelizations, have quite disparate if related meanings. If students are not familiar with a word but are familiar with the root, they may be able to develop comprehension of a word, even if they cannot read it properly. In English, by contrast, because of the absence of a root system, it is far more likely that one needs to be able to read a word properly in order to develop comprehension. This difference has implications for the strategies we use to teach young students to read Hebrew, especially after having learned to read English. Additionally, it is an important insight that poor articulation of written words does not necessarily correlate with poor comprehension when it comes to Hebrew. The educational value of Walker’s review is clear. At the same time, having this knowledge in the hands of day school leaders and teachers has an important role to play in supporting areas like recruitment and retention. Parents who are unfamiliar with Hebrew as a language may see their children reading words incorrectly and may conclude mistakenly that their children do not understand what is taking place in Hebrew classes. When educators can explain the differences between learning English and learning Hebrew because of its unique root system, parents will gain a greater appreciation for both what day schools are doing and why, and the expertise needed to help parents feel confident about their child’s education and their investment. Sharon Avni has written a study on the relationship between language and identity that is especially important, given the place Jewish identity holds in the mission of day schools. Because many Jews learn Hebrew for its utility as a marker of Jewishness, Avni notes the importance of motivation, particularly the motivation to be on the inside of a community (here, a community whose boundaries include speaking Hebrew) when learning to speak or read. She points out the important finding that motivation in second or foreign language education has a greater impact than ability or aptitude—something educators, who often desire Hebrew proficiency (as this is what they are called upon to do), neglect at their peril. This is because learning Hebrew is not only about the skill itself, or the ability to function in the language (which can also be highly valued), but the identity and social connections that comes about as a result. Of course, the opposite could be true: Students could have a decrease in motivation because of a desire to separate from a Jewish or Israeli identity. Both are important understandings for Jewish educators when thinking about the kind of connections they make in class, and materials they introduce to students. As with Walker’s review, Avni raises important questions for educators, and provides opportunities to make the case for day schools by focusing on the unique value of Hebrew language learning to Jewish identity. A paper by Avital Feuer shows ways that our field can use the research on Heritage Language (HL) learning and its application to identity development. In schools, we often focus on our core activities—curriculum development, material selection, instructional strategies—and the ways these choices improve learning. Feuer used the HL research to focus our attention on different criteria that are no less important, but not often top of mind for Hebrew language educators. One example is the importance of school structure in shaping a students’ educational experience. Is the school a day or supplementary school? Is its focus on social activism, to teach communal pride or ethnic values, or is it language proficiency? The answer to each of these questions leads to very different notions of identity development and to different models of Hebrew programming. Given that children mimic their parents and their values, Feuer underscores the importance of how Hebrew is used at home: Is it only used for ritual? For parts of common conversation or reference? As a valued commodity? Relationships with family or friends influence identity and motivation, hence the importance of twinning programs and Israel trips. However, how much do these programs impact learning Hebrew, and what priority should these approaches be given? Referencing the type of research reviewed above when working with families to understand how their children are progressing, when engaging prospective families in explaining how our schools teach, and in speaking with donors in making the case for Jewish day schools has the potential to elevate our field. This research may be marshalled to advocate, both explicitly and implicitly from its very reference, that Jewish education is a serious and significant endeavor. We believe that using educational research is essential in advocating for Jewish day schools. Our field already does this when we speak to the general studies side of our work. However, we have only a limited amount of high-quality research to point to in advocating for the distinct value proposition in the Judaic studies—half of our curricula—and to improve our educational practices. Ironically, it is this part of our schools that both defines who we are and holds the potential to distinguish us from every other educational option prospective students, families and funders are choosing from. In 1997, the United States Congress asked the National Institutes of Health along with the Department of Education to form the National Reading Panel to review research on how children learn to read and determine which methods of teaching reading are most effective based on the research evidence. That research has been used for over two decades to improve literacy and drive policy decisions among education advocates. The initial products on Hebrew language learning from CASJE-sponsored work suggest that the same is possible for Jewish education. We see an opportunity for schools to advance their missions by citing and using this research on a regular basis. We also see the further development of significant applied research as an investment in the future vitality of day schools. Rabbi Dr. Rafi Cashman is head of the Netivot HaTorah Day School in Toronto. Rabbi Mitchel Malkus EdD is head of the Charles E. Smith Jewish Day School of Greater Washington, DC, and co-chair of the CASJE Board of Directors.